The Newport 561D-XYZ ULTRAlign Stainless Steel Linear Translation Stage represents one of the finest stages Newport (or anyone else for that matter) makes. 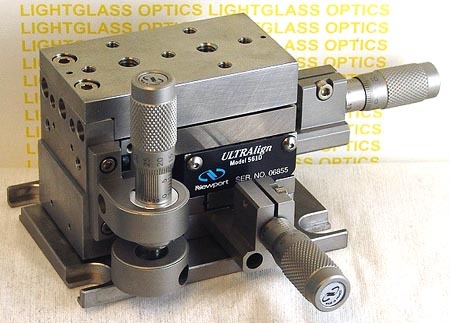 Ultra stable, with excellent linear translation, makes this very suitable for fiber optic and other precision work. It is a 3-axis stage with linear translation in the X, Y, and Z axes. Made with Stainless Steel for corrosion resistance and stability through a wide temperature range. Our price includes the 3 Newport SM-13 micrometer actuators, which give total movement of 1/2 inch in all axes.